Male 55, one careless owner, bodywork in reasonable order given year of manufacture, test drive available, any reasonable offer considered. Hellohello52 is a Male dating in Waterford, Ireland. 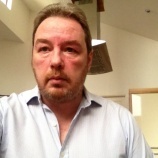 Check the description of this 56 years old profile, he is White/Caucasian and Agnostic maybe this matches your profile description and you can both start dating in Ireland for free. The stars says he is a Capricorn maybe you should check your horoscope and match up your star sign.